Results: v. Cliftonettes Black Won 16-0 v. Futureprint (Northants) Drew 8-8 v. Boston (Lincs) Won 7-5 v. Brigg (Lincs) Won 8-3 v. Horncastle (Lincs) Won 10-2 REGIONAL U12 CHAMPIONS! U11 FRIENDLY TOURNAMENT Saturday 26 February 2011 at Rushcliffe L.C. REPORT: A good evening of netball. This was an opportunity to try players in different combinations & positions. The players showed that they can adapt to new positions, shooting accurately & moving well in the attacking circle. The defence worked well throughout & remembered to mark the ball when the opposition had possession as well as getting interceptions. The centre court played some great netball & showed accuracy in their passing & finding space down the court. Well done girls keep up the hartd work. 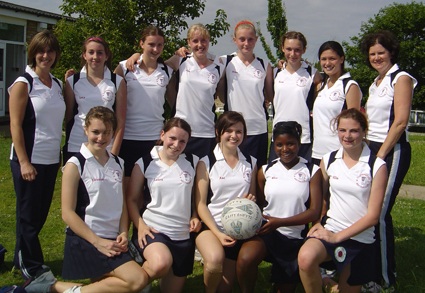 REPORT: A good morning of netball Cliftonettes won 19-0. All players got to play 40 minutes & played in at least 2 positions. There were moments of brilliance with some excellent shooting & very good team work but thereare still some areas to be worked on. Well done girls & thank you to Louise & Jenny for looking after the squad this morning for me. UNDER 11 High 5 Friendly Tournament Saturday 22 January 2011 Rushcliffe L.C. Report: A good day, weather was lovely. The girls played really well with improvement evident by the end of the tournament. The practices that the team did in between games made a big difference to their performance in the matches especially in intercepting the ball. Well done everyone. A big thank you to R.Owen for playing with the U15 squad, she slotted in really well & to Kathryn for giving us a player because there were only 7 U15s. We did not get a very good start going down 1-5 in the first half to Newark. We were playing too fast causing many mistakes. After the half time talk we were back on track, making a great comeback to win the second half 3-1 even though we lost the game. Overall play improved during the morning. Comments & targets for individuals: Shivani good progress, some good interceptions & better footwork. Megan taking passes more slowly. Georgie one foot to the line. Rhianna up to the line. Pippa drop back on goal line passes. Just little things like this will make a lot of difference. Overall a good performance by all the players, well done. A brilliant day to play netball, sun was out all day. Thankfully Newark organised the tournament so that the U15s played their own age group, leaving us up against just the U14s (Simples!). Keeping steady & controlled in the first two games resulting in winning 13-3 versus Hucknall & 11-0 against Kimberley.They could not quite hold it together against the tougher & bigger Stapleford players losing 5-9. After three matches in a row, the tiredness started to creep in losing 6-10 to Newark. However, you drew 4-4 with Stapleford in the second half of that match once you got your act together. You were 3-1 up against Newark in the first half of that match & then I could see you were physically running out of steam. That was tough & it is where that additional year of playing experience shows. Take heart, you played 80 minutes of tough netball which is longer than adult England players play in their matches! I selected S.Lawrence as one PLAYER OF THE TOURNAMENT for her REBOUNDS & TWO hands on the ball- well done! I picked G.Yates as the second PLAYER OF THE TOURNAMENT for her CONSISTENT good play throughout the morning & fantastic SPATIAL AWARENESS- brilliant! Determined Coach Kathryn Gubas- we'll do it next time! A mixed morning of cloud & rain, but happily not cold or windy. The RED squad played really consistently, winning their games & running away with the trophies at the end of the morning. Congratulations to the FAIR PLAYER OF THE TOURNAMENT A.Jarvis, she was given the most votes from all the attending teams. I awarded C.Dickinson MATCH PLAYER due to her development in the GS position by 'listening, thinking & playing' well done! The ROYAL squad had some close games all morning, unfortunately losing them by one or two goals BUT they succeeded against Kimberley winning 5-3. They should take heart as their true potential has not been able to fully develop this year yet. The weather & mixed availability have prevented them getting practice in a settled squad. Hopefully that will improve. Some outstanding performances from E.Sunderland & E.Walsh & I decided on P.Rimmer as MATCH PLAYER for her hard work & effort- 'great shooting now work on speed of movement & decision making'. Thanks to Gill for your constant support & Carolyn for umpiring again, you are both fab. We have now qualified for the REGIONAL EAST MIDLANDS U14 TOURNAMENT on Sunday 28th March 2010 in Long Eaton. Again, you all coped very well until we were up against the 'big under 15's'. The Newark players were tough opponents, but with a bit more height, I think you would beat Kimberley. It was E.Sunderland's initiation at this tough tournament, she was obviously nervous (unusually so for her) but soon settled & played well. K.Bowen was decked by an U13 player but thankfully not seriously injured just a lot of bruising. We ended the morning as Runner's Up in the Under 14 section AGAIN! E.Davies voted as PLAYER OF THE TOURNAMENT by her own players (and me)- 'brilliant as ever'! Worried coach Kathryn Gubas- hope that I am not expecting too much of you? A great morning's netball. We did not know what to expect playing up at least one age group.We need not have worried. The first game vs. Kimberley U15 who were tall girls, we held them 6-6 at half time. Sally had to come of feeling sick & we let them get away in the 2nd half. The only team we lost to in the U14 section was Newark so ended as Runners-up of the tournament. All the players deserved to be nominated as Player of the Tournament, they played brilliantly. Special mention for G.Goulding for stepping in at the last minute as two players cried off. She played 'out of her skin' talk about 'baptism of fire'! Also G.James was awarded Fair Player of the Tournament receiving the most nominations from all the opposition squads. WELL DONE GIRLS GREAT EFFORT, YOU BROUGHT TEARS TO MY EYES! Two teams were entered and the squads were named Cliftonettes A & B just to distinguish them for the purpose of the playing schedule. 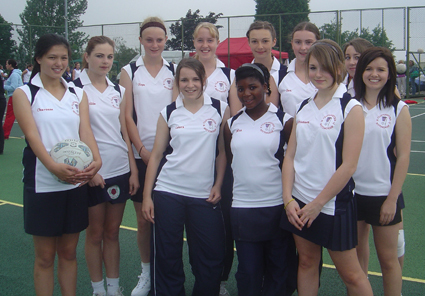 High 5 netball is the England Netball adapted game for the U11 age group. It involves games having teams of 5-a-side which gives players the opportunity to use more of the court space, all players rotate at each interval to play in the different positions during the tournament so that they gain experience of the different playing positions, the rules are adjusted to enable the players to gain experience & success eg the ball is allowed to be held for 4 seconds rather than 3 seconds as in adult netball. The B team were runners-up in Group 2 & went on to play for 3rd/4th place. They lost to Lions 1-2 & beat Hucknall 3-1 achieving 3rd place overall. All the players played well & showed true team spirit. Footwork was especially good. The courts were slippery so it was hard work to maintain correct footwork, therefore all the practice was worthwhile & paid off. Some excellent shooting & interceptions were evident. Some areas to focus on for the next competitions. Players need to use the time once possession is gained to pass or shoot the ball accurately & not too hastily. FAIR PLAYER AWARD: each team had to nominate a fair player at the end of each match. A special mention for Liberty Johnson who received the most nominations to achieve this award. Team Managers & Umpires: Jenny Knight & Ami Knight. UNDER 13 MINI TOURNAMENT Saturday 17th October 2009 Rushcliffe L.C. 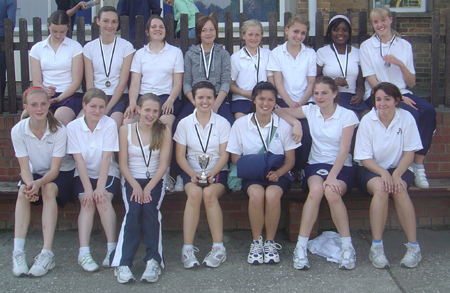 Once upon a time there was an U13 Gold netball team for Cliftonettes Netball Club. They went to Horncastle & once there found that they were playing in an U14 division. They were scared but gave it a go. They would have a big disadvantage in their netballing lives, careers, social netballing life, school netball if they didn't. The first match was great WOOHOO! They beat Horncastle Black 8-4. P.Rimmer & E.Sunderland were shooting, R.Forrest WA, G.Yates C, E.Bright WD, B.Corker GD & E.Walsh GK. COACH'S REPORT by Ami Knight: The team found it difficult playing in an older age group but tried their best throughout the day & never let their results get them down. P.Rimmer played most of her games in shooting positions & consistently got her shots in. E.Sunderland & G.Yates swapped between C & shooting positions, passing & shooting well wherever they played.A.Wakefield played WA & although smaller than her opponents, she used her speed to dodge & get into positions to receive passes. R.Forrest, E.Walsh, E.Bright & B.Corker all rotated in defence & centre court using their versatility to adapt their game & get some good interceptions. Most Improved Player: G.Yates for her increased confidence & improved scoring & passing skills. Royal team began with a fantastic win against Cliftonettes U14s. This was followed by a close victory against Horncastle Yellow & then a close game with Horncastle Red (the eventual division winners) which Royal eventually lost. We then faced fellow club team Gold winning in a friendly but competitive game. Lost to Hucknall Town but followed that by an amazing win over Horncastle Black. The last match was very tight with Royal coming from behind to beat Allestree Hornets. COACH'S REPORT by Ami Knight: The Royal team played fantastically well in every match. C.Dickinson & A.Jarvis shot well throughout the day, playing in both shooting positions. Both players played in other positions adapting their skills well. C.Southwell, G.James & M.Johnson rotated in centre court & wherever they played they contributed massively to the games holding the team together. E.Davies & L.Cottam played in attack & defence, their versatility meant that the team always worked well. S.Lawrence had a fantastic day in defence- her impeccable timing & incredible interceptions contributed to her selection as Player of the Tournament. Most Improved Player was A.Jarvis after a slow start she picked up her game & became one of the most influential players on the team. REPORT: Due to having a new combination of players we did not start too well. After the first 2 games & some coaching inbetween we never looked back. The defence really became good, well done to J.Mawhood & A.Saccoh for listening & performing. Everyone on court gave their best effort. There are still a few errors that need to be sorted, but everyone learnt something to improve their own game. It is pleasing to see the improvement, the positive atmosphere & enjoyment shown by the players. Well done to everyone. Tournament Team Player: J.Mawhood (that extra effort made such a difference- you looked great)! REPORT: Well played to everyone for keeping positive despite strange decisions in the first game, not allowing the result to affect the way you all played for the duration of the tournament & doing really well in an U16 division. You continued to give 100 percent. During each match all players made exceptional interceptions & turned the ball over many times to our advantage, capitalising by scoring some great goals. Be confident in your ability & enjoy the participation & well as improving your performance through that confident play.Well played everyone! Congratulations to all 5 players on their effort & determination in playing over 100 minutes of netball. On arrival we had to declare the team & not having the required squad of 7 had to play friendlies. Both Horncastle teams also played friendlies due to low numbers in their squads BUT they had fielded another team to replace a club who had withdrawn from the tournament. The players were nervous since this was their first taste of competitive netball for the club, but determined to play their best. In their first game they showed the opposition how to play & score. No matter which player was GS/GA they all scored goals. Throughout the day all the players produced interceptions, turnovers, some excellent footwork & good reading of the game. It was rewarding to see what they had learnt in training was being put into practice. Even though the team was undefeated we could only finish 2nd since Allestree were the only team with the correct squad number. The girls know how well they played & the smiles on their faces said it all. Keep up the good work & well done for keeping going despite being tired. Thank you to Ami for umpiring despite her injury & to Carolyn for helping out with the last two matches. The players & I had a lovely day. They are tried their hardest resulting in a very pleasing Runners-up place. There were some brilliant skills on display on court & their behaviour & good manners off court were also exceptional. Well done to many of the players on their excellent performance when playing out of position. Sacha's shooting was absolutely fab, she hardly missed all day, Zoe made some great interceptions & Emily played the best netball I have seen her play. It was a good tournament with fantastic sportsmanship shown in all games. Thanks for a great day & well done girls! REPORT: Well done to all 7 players on a cold evening. All players played well in their first glimpse of the teams that compete in the Nottinghamshire Netball Association Winter League. All players made outstanding contributions through interceptions, closing down the opposition's space & scoring goals. The new combination meant that the players had to be positive & work hard to ensure good team play. Well Done!! CLIFTONETTES U13 MINI TOURNAMENT Saturday 12th September 2009 Rushcliffe L.C. REPORT: Great opening to the season 23 U13s turned out at 9.00am on Saturday morning. It was sunny & hot so we played 5 minutes each way twice. All were close games which would have been even closer but for an early injury. Fortunately the player was back on her feet for the last game for GOLD which they won 7-3. Could not decide between James (C) & Yates (WA) awesome combination. Outstanding WD by Goulding remember you do not have to say sorry for playing great netball! Finally great movement, great timing & great shooting by Cole (GS). I hope that you all enjoyed it, I know I did? REPORT: Absolutely brilliant start to the season. We had 11 players on Saturday which can be difficult but these are team players always putting the team first not themselves. We had a really tough section with both TURNFORD & OLDHAM not to mention HERTFORD HORNETS. An excellent start beating both BLACKPOOL 11-4 & YENDYS 5-2. We lost to the other three teams but won the final game against BIRMINGHAM 8-6 qualifying for the CUP! Sunday arrives & we are in a win win situation. To play against the top teams in the country is just what the players needed. Now they know what standard to aim for. Their best achievement was holding Turnford (eventual U13 winners) to only 6 goals. Our defence line-up was exceptional Lawrence, Davies & Bowen. We nearly beat TAMESIDE losing by only one goal in the last few seconds 2-3. We came 7th overall but had the personal satisfaction of knowing that we would have won the Plate having beaten five of the teams in that competition including Birmingham (Plate winners) & Hucknall (Plate runners up). REPORT: The teams in this division traditionally presented strong opposition & meant that there were not going to be any easy matches. This did not deter the squad. Unfortunately we lost every match but the players were positive, supportive & sporting at all times. The team needs to concentrate on keeping possession to get the ball into the shooting area (& also to tie their hair back so that they can see better & concentrate on their play, you know who you are girls)! On Sunday teams were regrouped according to Saturday's results. We played some of the same teams again & reduced the number of goals they scored this time. The highlight on Saturday was the game where all the squad played in different positions, Titch excelled as GK & Beth as C (first time out of defence). REPORT: What a fantastic day! The girls should be proud of themselves, Jo & I certainly are! Players had to undergo a selection process at training since we could only enter one team in this regional event. The players were observed during training sessions by the coaches & the junior coach mentor. The selected squad did a fantastic job, each giving 100 percent at all times when on court, scoring 89 goals & conceeding only 10! This excellent achievement of first place ended our day with big smiles all round. The girls made me proud to be their coach & team manager & were brilliant ambassadors for the club. The results do not reflect how hard the girls worked in all of their matches. They had to adjust to playing together as a squad again. The weather was good over the weekend & they all seemed to enjoy themselves (dig the fashion girls!). A very pleasant, well-behaved group making it an enjoyable weekend. Thank you to the umpires & Claire for her help. REPORT: The players had a great weekend, the weather was absolutely fabulous & it was a new experience for the girls. Initially the players found it difficult to settle into the games on the Saturday due to having different combinations & positional changes & the higher standard of the opposition that we had not experienced often. After a good meal & fun at the fair on Saturday evening the girls woke up on Sunday morning with a fighting spirit & were raring to go. In the Plate competition on the Sunday these attributes became apparent throughout the day since the squad won all 6 games in the group stage! This winning streak was sadly terminated by Manor in the semi-finals who beat us 7-8. Very disappointing for the players but they should be proud of their achievements throughout the weekend. Thank you to the umpires for their help & hard work & also to my U11 squad for making the weekend so enjoyable. A wonderful weekend even the weather kept brilliant for us. In trying to get as many games as possible for all the players this does not always enhance their play- swapping & changing positions.However this is really good experience for their development. ROYAL SQUAD: L.Cottam E.Davies C.Dickinson H.Fowler G.James M.Johnson R.Owen P.Rimmer C.Southwell were very supportive of each other which was evident on court.They had one of the toughest draws against clubs like Turnford & Woodley. They WON 2 DREW 1 LOST 4 on the Saturday qualifying for the Plate competition. LOST to Swan (another big club) DREW with WCNC & WON the other 2 matches easily. This meant that WCNC went through to the play-offs. Team members were asked if they could select a player's player of the weekend (they have set a trend). Royal squad voted for M.JOHNSON. As her confidence grew & she settled down, interception after interception just kept coming her way.Ecxellent play & a good choice. After giving it much thought I wanted to select everyone for Coach's Player of the Tournament. You really do ALL deserve recognition, however, I selected R.OWEN because of her constant determination & effort against some very tough defence. Always positive in her play in whichever position she was put. Special thanks to Sue, your help & support is very much appreciated. Claire I could not have done without you. Thank you for managing the GOLD SQUAD. It was a very good weekend. We were especially lucky with the weather. The girls were all well behaved (apart from some late night talking on friday- put that down to excitement. Saturday was not too bad, they were tired from playing in the heat)! They all seemed to enjoy themselves especially as, only having 7 players per squad, everyone played in all the matches. Fortunately everyone felt well with no injuries. The results do not always reflect the good moments of play. Thanks to the umpires & Claire for her help. Unfortunately the number of entries from different clubs to this tournament were not as many as we had been led to believe. Allestree only entered one team, Ripley NC did not turn up. Our club teams ended up in the same section playing each other. The Under 13s did not have set squads. The Team Managers were able to change players around. Teams in that section played each other twice. Heavy rain stopped outside play & shortened matches were played indoors. It was a good day for trying different combinations. Most players responded well to the changes. The results do not reflect the excellent effort & team play that the squad displayed. A good day overall. 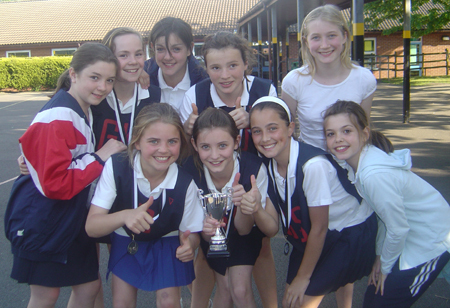 Congratulations to all the players on an excellent day of netball despite the change to the format due to the weather. All the players played exceptionally well, making outstanding contributions in the matches. REPORT: Amazing performances yet again from both teams. I would like to say a massive thank you to three U11 players I.McGowan-Crewe, W.McGowan-Crewe & S.McGowan-Crewe for helping out the U12s by playing up an age group. The players played well with strong, accurate passing & good footwork (in most cases). The defending was fantastic with some amazing interceptions especially from M.Day & the attacking players got into some good spaces working the ball around the circle to make excellent feeds into the circle players. An enjoyable & successful day, thank you girls!! A great performance from the players winning all their matches to become Tournament Champions. The matches were not that easy so they put their training skills into the game situation. They were not even fazed by the 6ft GK in the first match against Horncastle.They did have a slight 'hiccough' against Stapleford drawing 1-1 at half time, but they stayed calm played good, safe netball eventually winning 8-5. This showed a maturity that many adult netballers would be envious of. The WA A.Jarvis has been awarded the ROYAL 'Player of the Tournament'. She kept the attacking end calm & focussed whilst making the GD & GK jobs a little easier by making several turnovers before the ball got down to our defending circle. A massive effort & commitment from all of you, a well deserved success. Three U12 teams were entered in the competition which was fortunate since players would have had to wait 2 hours between games. The players on this squad had to get used to the different styles of play. After several changes of position for most of the players once the shooting positions were settled the team won their last match 5-3. There is a lot of natural talent in this group & their enthusiasm is unstoppable. E.Walsh was awarded the WHITE 'Player of the Tournament' her commitment to the game, the club & her team players is unwavering. She played a fabulous GD, the scores would have been very different without her efforts. REPORT: The players had a good morning & the weather was perfect for playing. They all did very well, playing some good netball even though they were not all used to playing as a team & in different positions. The players listened well to the coaching points & it was pleasing to see the positive effects of Monday's training sessions. Fantastic results & great effort girls, well done!! A good day for all the players & great weather for playing. The players did very well, playing some good netball even though they are not used to playing as a team & different combinations were tried out. The players were very receptive to the coaching & advice given. Their effort was pleasing. L.Borrie GD A.Blackmore GS & E.Burleigh GD all received a vote as Fairplay Player & R.James was awarded the overall FAIRPLAY PLAYER award for the tournament. The votes were cast by the opposition for every match. Well done to everyone. Finish position 4th overall. With thanks to Maggies for her hard work. Result LOST 14-16 qualified for division 2. This means that the club cannot qualify for the National Finals, only the winner & runner-up in division 1 qualify for the next round. Report by C.Gibson: On a very wet & cold morning the U16s had to face Nottingham City to qualify for either division 1 or 2 of the Regional League in a game of 7 minute quarters. The players knew this would be a tough game. The start was very scrappy & the ball was turned over constantly by both teams resulting in 4-4 at quarter time. The opposition found form in the next quarter with their centre court players creating problems & Cliftonettes unable to get the ball into the shooters. At half time we were 2 goals down but this was within the team's capabilities to change the outcome. Cliftonettes came back with greater determination, found some form & held the opposition at times but still lacked consistency missing far too many opportunities to take the ball to the goal. An injury to WA A.Bolton meant team changes had to be made. Credit to the team that they won the last quarter but were still adrift by 2 goals at the end. This meant a place in Division 2 of the Regional League & therefore are not able to qualify for the National Finals this year. A.Bolton played in the WA position for three quarters of the match working very well within the team. Also H.Walton played her first match with the squad & had a good game with the support of the other team members. U16 REGIONAL LEAGUE v. Horncastle Belles (Lincs.) 22nd February 2009 (Aw) cancelled by Cliftonettes due to lack of available players. Result: match was conceeded by Cliftonettes at half time with the score at 5-16 due to an injury to a player and with no reserves it was difficult to continue playing the match. The squad consisted of club players from the U19, U18 & U17 age groups who are members of different league squads & therefore had had limited time to train as a team. They played some very good netball in each game to finish 6th in their division. WON 2 DREW 1 LOST 5. Their best performance was against Weston Park Blades (who were a very strong team eventually qualifying for the semi- final in that group). With the score 1- 10 to the opposition at half time their determination & steady play ensured that they drew the second half 5- 5! The players never relaxed their competitive play in any match. More practice in teamwork would have made a difference. Weston Park & Academy qualified for the semi- finals from this group playing Oldham (NW) & Oaksway (NE) from the other group for places in the Final. Overall is was a very good day, great experience & all the players should be pleased with their performance. Well Done!! It was a very close contest and in the end the U19s qualified as Runners up on goal difference. They will be attending the National Finals on the 6th December in Blackpool. WELL DONE to all the participating players on their good play & many thanks to the officials for their help & support in making this achievement possible. GOOD LUCK IN THE FINALS! We have received information about the following events/ tournaments for this summer term. We will be entering/ have entered & will be attending some of these events but thought that it would be useful for players & parents to have all these dates & information. Individual letters will be given to all affiliated available/ selected players in the different age groups for the different tournaments giving details of the event that we have entered/ venue/ transport/ times & requirements. WINNERS of the U16 competition. All the squad members produced a determined work rate & played their best. An excellent result. Each player received an individual medal & a team trophy for the club display cabinet. Playoff v. Stapleford WON 4-3 all players played extremely well & tried their hardest resulting in a narrow victory after extra time. Overall position 5th out of 12. Playoff v. Blaze B WON 4-3 with the players working so hard that their sheer determination bagged them a win by 1 goal! Overall position 11th out of 12. The day was a complete success, the weather was fantastic and everyone had an enjoyable time. We are very proud of the girls, they behaved brilliantly & played to the best of their ability. They are a credit to the club & excellent representatives of the sport. We thank all the officials for their time & hard work. Without their commitment the players would NOT have the opportunity to participate in these events. Our thanks are also extended to parents for their help & support. The full report can be viewed & printed from the DOWNLOADS page. An excellent weekend for the squad (again despite the weather) & many thanks for the support of the officials Jenny Knight, Chloe Gibson & parents Phil Duckworth & Debbie Alvey. The full reports can be viewed & printed from the DOWNLOADS page. An excellent weekend for the squads (despite the weather) and many thanks to the officials Kathryn Gubas, Gill Barradell, Maggie Boyd, Emily Leigh, Jill Bullock & Carolyn Robinson for their time, effort and commitment. Cliftonettes won all their games in the division fairly easily. Barge & Bottle gave them some physical challenges. Cobras, a lovely team also gave them a run for their money. Final match was a challenge 0-10 to Derby Vets (with some ex England players)! Semi- Finals: expected it to be against Gauntlettes but they had lost to Mollbuzzers. The team went into this game intent on restoring their pride gaining a quick lead of 4-1 finishing the first half 5-2 up. They continued to play safe, steady netball virtually fautless increasing their lead to 7-3. BUT they became unsettled after a few 'unusual' umpiring decisions & lost the match in the last couple of minutes by 1 goal 9-10. A very unlucky situation which meant NO SECOND CHANCE to play Derby Vets in the final.This was between Mollbuzzers & Derby Vets who were winners for the second year running. Fantastic effort by Cliftonettes with only 7 players & two players also having to umpire (thanks to Sadie & Jo) plus a great debut return by Chloe. Unfortunately the U16 Section was a disappointment since 4 teams did not turn up (Allestree, Phoenix, Barge & Bottle & Lincoln) resulting in only 4 teams in that division & therefore 3 slightly longer games. The Cliftonettes squad are all U15 players. A pleasing return to playing again after injury & following a prolonged recovery period by A.Ford. Results: v. Knighton WON 7-3 v. Barge Imps LOST 8-13 v. Charnwood LOST 3-7 v. Barge Jets WON 12-3 v. Alfa LOST 6-7 v. Brigg WON 17-1 v. Pennine (team withdrew) Overall position 4th. Winners & Runners Up qualified for the finals on the 3rd. November in Bournemouth. An excellent, very close result against the eventual winners Alfa losing by only 1 goal & leading at half time by 1 goal. A very promising achievement for this 'young' team with some excellent play by individuals & positive teamwork. Many thanks to all the officials for their time & effort and to the parents for their support. Tupton Hall School, Chesterfield, Derbys. To the mixed squad of senior & Under 19 players CONGRATULATIONS & WELL DONE on your achievement. Many thanks to the officials for their time & to the parents for their help & support (on a rather overcast & wet day). Position 2nd. in division on Goal Average beating Essex Open A.
Quater Finals v. Turnford LOST 8- 10 but still smiling!! Turnford were the overall winners of this Finals competition. Cliftonettes final position 5th. out of 36 teams. A brilliant achievement. Please view the England Netball website for a comprehensive report by following the link on our links page. An excellent & exciting performance from our players and a good day for all concerned. Many thanks to all the officials & parents for your help & support. Results: v. Horncastle DREW 6- 6 v. Newark Shooters WON 4- 1 v. Cliftonettes Red WON 5- 0 v. Alfa WON 6- 4 v. Boston High WON 8- 1 v. Barge & Bottle DREW 4- 4 v. Grimsby WON 9- 3 OVERALL POSITION 1st. Results: v. Horncastle LOST 0- 13 v. Newark Shooters LOST 0- 6 v. Cliftonettes Navy LOST 0- 5 v. Alfa LOST 3- 6 v. Boston High LOST 3- 4 v. Barge & Bottle DREW 1- 1 v. Grimsby LOST 2- 5 OVERALL POSITION 7th. Well done to both U14 teams on the excellent achievement & a very successful day. It was good to see so many club players from these age groups involved in the tournament. The success achieved by all the squads was fantastic. In particular well done to U12 Navy & U14 White winners in their age group and the two U11 players who played in the U12 team to ensure that they had a full team. The disappointing aspect of these events is the fact that players DO NOT TURN UP ON THE DAY or DROP OUT A DAY OR SO BEFORE THE EVENT. This results in teams being short of players and the event running at a loss because the number of players travelling on the coach is reduced. The club organises the size of transport to accommodate a set number of players & officials (and one or two spare places for parents). When that bus is not filled the extra cost is covered by the club because we do not wish to pass additional costs onto our participating members. Please bear this in mind for future events. Thank you for your consideration & cooperation in this matter. The Rushcliffe Academy this season had 11 Cliftonettes players in the squad of 24. The following Club players took part in the tournament:- D.Afford E.Evans C.Hepples A.Milton L.Bailey. Unfortunately 5 others were unavailable & 1 player was ill on the day. The squad came 3rd. losing 2 games and winning 1 v. Newark LOST 3- 20 v. City of Nottingham LOST 3- 23 v. Ashfield WON 10- 8. Many thanks to the players for their commitment and to the parents for their support. NCC ACTIVE SPORTS U11 HIGH 5 FESTIVAL @Rushcliffe L.C. Results: v. Chetwynd LOST 0- 3 v. Cliftonettes Gold LOST 0- 8 v. Gotham LOST 0- 12 v. Horncastle A LOST 1- 17 v. Horncastle B LOST 0- 7 v. Hucknall LOST 0- 11 v. Kimberley LOST 0- 6 v. Newark LOST 0- 10 v. Stapleford LOST 0- 12 v. Pierrepont LOST 0- 3 Final position 11th. Cliftonettes lent 2 of their players, E.Walsh & M.Johnson to Stapleford N.C. who only had 5 players. They said that they had fun with them & enjoyed the day. The Red squad showed good improvement throughout the day having played against players that were both older & more experienced than them. The Gold squad worked very hard with only one sub., continuous play throughout the day and the rain to contend with!! Their footwork was nearly perfect all day- well done. Passing and movement skills were fantastic with some great interceptions. Rotating positions for each match meant a rest for 1 player but the players on court gelled really well each time. During training we need to concentrate on gaining the rebounds & building on the skills gained so far. Great effort & performances despite the rain. Horncastle were the winners & Gotham the Runners Up. The squad finished as winners on goal difference and have qualified for the England Netball National Finals on Sunday 10th. June 2007 in Gillingham, Kent. Many thanks to all the officials for their hard work & commitment with the U14 age group & to the parents for their help & support. Well done to the players on their achievement. Unfortunately I got lost trying to get to the venue but the players started their warm up helped by the parents. Well done to the team and many thanks to the parents for their help & great support, especially Jill Bullock for umpiring. The morning was fun and the girls really bonded as a team. Unfortunately there were no reserves, the matches were long and with only short breaks in between the games this tested the player's fitness & stamina. Each player pushed herself to play well and the effort that they all displayed was impressive despite their tiredness!! R.James had a hard task playing GA and C for the whole day, driving forward for the ball with consistently good footwork and chasing all the loose balls. She had obviously taken on board this aspect which had been coached during training. B.England changed from attack to defence really well showing brilliant improvement throughout the day. Following instructions to jump high when intercepting she 'stole' some great balls from the opposition's attacking play, resulting in goals for us. E.Burleigh also played in attack and defence. Her positioning as a defender and in the shooting circle was great; her passing was very strong and her consistent shooting ability produced some fantastic goals. C.Brown really upped her game to fit in with her team members who are a year older. Her movement around the court has improved immensely creating space in attack and working with others to feed the ball into the circle. P.Bullock played C and GK. She defended hard making some great interceptions. As C she never stopped running playing a vital role in linking the passes down the court. Overall the improvement was excellent. The scores were close and with a larger squad or longer breaks between games we could have continued to play as impressively as we did in the first match. Hucknall Town came first but the good standard of play displayed by all those teams who took part is reflected in the close results. Well done girls for all the hard work and for adapting to High 5 so successfully. Semi- Final v. Gotham DREW 1- 1 LOST 2- 1 in extra time. Unfortunately some of the U11 players/ members were not available to play & others did not turn up on the day. We only had 9 players for 2 teams. The organisers were very accommodating and allowed us to use players from the 2 teams to ensure that we had 5 players on court for each match. Well done to all the players who played 2 matches in a row. Without your hard work we would not have had the same positive outcome in each game. GOLD: Worked really hard playing in the different positions that they were not used to with various combinations. Undefeated until the semi- finals, they showed how working well during training, focussing during practices really paid off. Their passing improved throughout and they reacted well to instructions from the coaches and umpires. They won their division and drew with Gotham in the semi- final. The match continued to the 'first winning goal' where we had several chances to score first, unfortunately we did not and Gotham did. RED: Played extremely well with different players that they were not used to. It took a while for their confidence to build, but once they had experienced playing in the various positions, their game picked up. Each game was approached enthusiastically and they worked hard continuously. They also reacted well to coaching points directed to them which was reflected in their progressively improved play throughout the day. Well done. Overall it was a really positive performance from all the players and each time the results reflect improvement. Congratulations and keep up the hard work Many thanks to the parents for their support. A brilliant day! The tournament this time was organised differently. Due to the high number of entries teams were divided into 2 divisions of 5 teams with a semi- final and final between teams from the two divisions. Both Cliftonettes teams came 5th. in their division. The teams was a mix of younger, less experienced and new club players with older players. Some of the players had not experienced any competitive matches before which was a big learning curve for them. They learnt a great deal from this one event. The Red team worked really hard, moulded as a team, supported each other and improved on their attacking play coming forward confidently to receive the ball. Passing was inconsistent in terms of accuracy but that can be addressed at training. The defence worked hard on interceptions and through this determination the gap remained close. In both teams it was very promising to see the girls learning new positions and their roles- a good foundation to build on in their next few years as Under 11s. Soon they will be the experienced, older ones winning every match! Many thanks to the parents for their support and encouragement whilst the girls were taking part. We will be organising some friendly fixtures against clubs to give more players the opportunity to play some competitive netball. The players arrived on time, ready to play, all with the correct kit and enough food & drink for the WHOLE DAY plus very supportive parents.... a good start to the event. WON 2 DREW 1 LOST 2 WELL DONE!! Overall Cliftonettes came 3rd!! An improvement on last time which shows the hard work that they have been putting in at training. The passing was strong, footwork was generally good. They kept working and even got competitive & determined against the scary boys!! All the players changed round well playing in a range of positions. The defence tried really hard getting some great interceptions, whilst the attack found good space and worked the ball around the circle sensibly. The change from a 7- a- side game to High 5 is difficult but the players adapted well. The improvement was evident in every player. I'm sure that they are now looking forward to the Junior League to see how they fare in the full sided games. The focus now is on match play, consistent attendance & hard work at training to continue the progress made so far. The bonus was that it wasn't chucking it down with rain like last time in November! Half way through the morning the Gold team had to be withdrawn from the event since 2 players from the Gold team & 1 player from the Red team had to leave for other commitments. 8 players were left which the tournament organisers agreed could be combined to form 1 squad. Stapleford and the other participating teams were very understanding in allowing us to do this. It meant that all the players were able to play in all the matches. Matches were 4 quarters of 5 minutes so it was hard going especially for the less experienced players. They tried hard & kept smiling even when it was raining & they were not winning. The players & their play improved throughout the day with some good spells of determined attacking & defending teamwork. WELL DONE to the Gold team on their fighting spirit.